First Line: Montalbano had been given a sort of prediction, in the most indirect of ways, concerning his upcoming promotion to inspector. Salvo Montalbano is thirty-five and has heard that he's about to be promoted to Inspector. His greatest fear is that he'll be kept high up in the mountains he hates because he longs for the sea. After some machinations by his girlfriend, he learns that he is to be transferred to the seaside town of Vigata in Sicily, so he goes to check out the place. He witnesses a traffic accident in Vigata where a young man jumps out of his car and punches the much older second driver in the nose. He makes a witness statement as a private citizen then thinks no more about it. Once transferred, he's called to testify at the trial concerning the accident, and there he meets a very unusual-- and very beautiful-- young woman who is at the heart of a very puzzling case. Montalbano's first case. This prequel to the wonderful Inspector Montalbano mystery series by Andrea Camilleri will be read eagerly by all his fans, and is a great starting point for those who have yet to read any of the books. In it, we see a young Montalbano when he first arrives in Vigata. We get to see him choosing his home. We get to see him finding all the best restaurants in which to eat and learning to work with the rest of the staff in the police station and a journalist at the local television station. We watch him take his first tentative steps as an inspector with lawyers, Mafia families, and witnesses who don't want to talk (or who want to talk too much). All the pieces are there, except for two. Montalbano has yet to meet Livia... and we get no chance to meet the delightful Catarella ("personally in person"). As a story, I rate it highly. I loved seeing Montalbano in the early stages of his career, yet there was something that bothered me, and I didn't pinpoint what it was until I'd finished reading the first chapter. The book just didn't "sound" right, and that is because it has not been translated by Stephen Sartarelli. After eleven books, Sartarelli's translation has become Camilleri's voice to me, and the difference is quite noticeable. 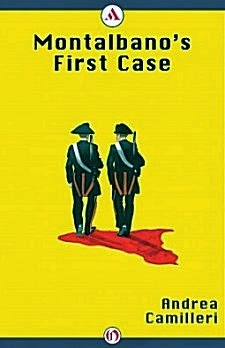 Of course, it won't be obvious to anyone who has not read any of the other books in the series, and I will hasten to say that Gianluca Rizzo and Dominic Siracusa have done an excellent translation of Montalbano's First Case. It's just different and took me a while to become accustomed to it. At roughly 100 pages in length, it's also disappointingly slim, even for a concise stylist like Camilleri. I do value it, however, for its brief look into the earliest case of Montalbano's marvelous career, and I do recommend it to anyone who has yet to sample one of the best mystery series going. Cathy - That just goes to show you the importance of really expert translation. I'm so glad that you enjoyed this, but yes, the story sounds and flows much better if it's translated smoothly and with synergy between author and translator. If I hadn't read Sartarelli's translation first, I would've thought this one was just fine. Well, I haven't read this book, but I have watched all of the Young Montalbano TV episodes. They're on dvd, sold by MHZ Networks, which carries lots of European TV series, with subtitles. I am so enthusiastic about this series. As a woman friend of a certain age has told me, "He sure beats the older, balt Montalbano." Played by the adorable young Italian actor -- with hair -- Michele Riondino is just wonderful. I've only seen the first episode, but I did enjoy it.